Get a hold of this beauty ! The Louvre is still offering great deals. If you are a millionaire and would like to organize an exhibition, this is definitely the place to come : ask for a couple of masterpieces and it will see you get them on condition you pay the right price. It seems that only the Mona Lisa is not for rent. At least officially. But you can have any other Leonardo you want. This is not even an agreement between museums, as claimed by Atlanta in its defense. The Louvre is renting out its masterpieces for 4 million euros, a figure that is not stated explicitly in the press release, to a private firm. The theme of the exhibition is devoid of any artistic meaning : The Louvre in Verona. Leonardo, Raphael, Rembrandt and the Rest. Portraits and Figures ! Given the vast subject, any painting can apply except for landscapes and still-lifes. 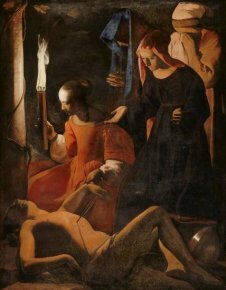 Hence, the list also includes : besides the Leonardo, la Belle Nani by Veronese (ill. 2), The Holy Family with Saint Anne and Saint John the Baptist by Bonzino, the Virgin with Cherries by Annibal Carraci, Saint Sebastian Tended by Irene by Georges de La Tour (ill. 3), the Marchioness of Santa Cruz by Goya, the Virgin with Pomegranate by Filippino Lippi. And quoting Il Gazzettino of 26 March, we may also add : the Portrait of the Artist with a Friend by Raphael, as important as the Baldassare Castiglione sent to Atlanta, the Madonna of the Guidi de Faenza by Botticelli, as well as many other first-rate works (notably by Ingres, Rembrandt, Titian, El Greco, Ribera, David, Durer, Poussin, Holbein, Solario, Champaigne and Luini). In passing, let us note that just barely back from Atlanta, the Portrait of the Infanta is flying off again, still presented under its newly ascertained pedigree as an acknowledged Velazquez. 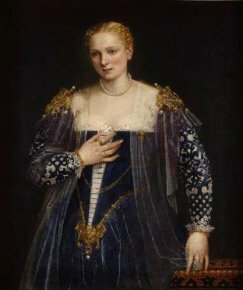 While the director of the Uffizi Gallery refused to be present at the departure of Leonardo’s Annunciation after being loaned against his advice by the Italian minister of Culture (see news item of 13/3/07 on La Tribune de l’Art), the director of the Louvre has unabashedly agreed to lease dozens of works of major importance behaving much like a shopowner eager to make a sale as if he could personally dispose of works belonging to all. Are French museums still public establishments in the most noble sense of the term ? Some supporters had justified the case of Atlanta and Abou Dhabi by saying that the Louvre needed to find funding. How can we still believe this excuse when the museum has just received a part of the manna flowing in from Abou Dhabi ? The Louvre’s coffers are overflowing but it is still greedy for more . Everything pertaining to this exhibition is cause for scandal and reveals the extent of the policies that we have consistently denounced. How far will this perversion of a museum’s mission go ? The beloved French comedian Pierre Dac used to say : “Once you step over the line, there are no more limits” . The Louvre is literally stepping over the line and, in this instance, it is not funny. 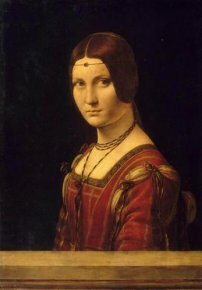 "Con la “Bella Ferroniére” giungeranno a Verona altri 140 capolavori - e il termine è, una volta tanto, non abusato - del museo parigino, tutte opere regolarmente esposte nelle sale del Louvre e non provenienti dai depositi." As the Musee du Louvre never - or only after several weeks - answers our sometimes disturbing questions, we did not contact it. However, yesterday morning we did ask, by phone and e-mail, the Ministry of Culture if they had validated this operation (its agreement is in fact indispensable) and if so, how they justified doing it. Although we made it clear that the article was to be published today, at this time we have not yet received any answer. Even the Louvre exhibition in Quebec, Les arts et la vie (sic ; see news item of 7/11/06 on La Tribune de l’Art) which could be seen as purely diplomatic is being leased for one million euros. "Quand les bornes sont franchies, il n’y a plus de limites"